Engaged this Valentine’s? 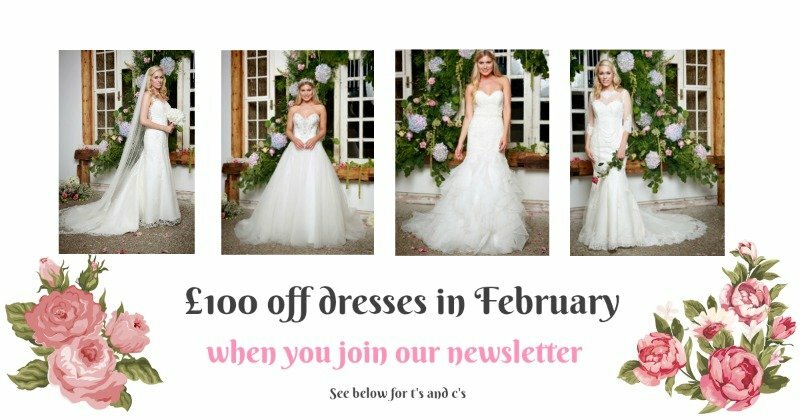 At Copplestones Bridal we’re suckers for romance and are offering all our email subscribers £100 off any wedding dress in store priced £500 or more. Plus, once you’re on our mailing list you’ll be the first to hear about our news, competitions and offers. Why not come and see our range of beautiful dresses now? Book your appointment or browse online. * Once you’ve signed up, you’ll receive your £100 email the next day, but if you haven’t received it, call the CHester store on 01244 400570 and we can check for you. *Applies to new customer orders only. * Dress must be priced £500 or higher. Includes all ranges in either Liverpool or Chester. * Dress can be ordered at either our Liverpool or Chester store. * Dress must be ordered by February 28th 2018. * Normal in store t’s & c’s apply. *There is no cash alternative in whole or in part of the offer. The prize is non negotiable and non transferable.